This classy, refined bisque for two is the perfect start to a romantic Valentine's Day evening. The quality of pasteurized crabmeat is worth its rather high price tag (about $20 for a 12-oz. can). No tedious claw cracking required! This isn’t the same crab found near canned tuna—it’s usually in the refrigerator case at the fish counter. Sweat leeks, carrot, celery, and garlic in oil in a Dutch oven or large pot over medium heat until carrot is soft, 8 minutes. Add flour and cook for 1 minute. Deglaze with wine, simmer until nearly evaporated, then stir in cream, milk, and clam juice. Bring to a boil, stirring occasionally, then season with salt, pepper, and Tabasco. Off heat, purée mixture with an immersion blender. Ladle soup into bowls. 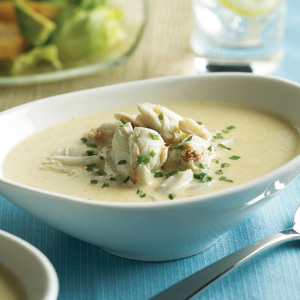 Top each serving with 1/4 cup crabmeat; garnish with chives. Serve with Avocado-Orange Salad. Leeks can be sandy, so dice first (white and light green part only), then soak in water and drain well. Since there is no crabmeat in the soup itself, the seafood flavor is enhanced with clam juice. If you have a hand-held blender, puréeing the soup is a snap. But a standard blender works fine too. Full of good-for-you vegetables and topped with hearty steak, this quick salad leaves you totally fulfilled.